At least 140,000 pregnant women drink frequently in the United States every year, according to a recent study by the Centers for Disease Control and Prevention. The more women drink, the more likely it is their babies will suffer mental retardation, learning disorders and other problems. The study, released in April, found that the percentage of pregnant women who drank frequently increased substantially, from 0.8 percent in 1991 to 3.5 percent in 1995. Frequent drinking is considered to be more than seven drinks a week, or more than five drinks on one occasion in a month. The study found that the rate of moderate drinking among pregnant women also rose. Experts predict the increase in drinking is likely to translate into a greater number of babies with fetal alcohol syndrome and fetal alcohol effects. Debbie Crowell worries that 7-month-old Sabrina may have fetal alcohol syndrome. Crowell, a recovering alcoholic, was forced into treatment after Sabrina's birthday. Now seven months sober, she's learning to be a good mom to her seven children. EDITOR'S NOTE: Tucsonan Debbie Crowell has graciously agreed to share her personal nightmare with Tucson Citizen readers. She hopes her story will prevent another child from being born under the influence of alcohol. Crowell is turning her life around. Read about it in Part six of the Tucson Citizen's package on Fetal Alcohol Syndrome. With every sip that Debbie Crowell took from the icy can of Budweiser, the tiny baby growing inside her belly became more and more drunk. Crowell, 29, knew that as a pregnant woman, she shouldn't drink. But she had drunk during some of her six pregnancies before this one, and each of those babies looked OK to her. So she drank. When she got up in the morning, she'd start. When she felt as if she'd had too much beer and was about to pass out, she would use cocaine, so she could drink some more. Sitting in her living room or on the front porch of her Ajo home, she drank until the beer was gone - about an 18-pack every day. As Crowell got more and more drunk, so did her child, Sabrina, now 7 months old. Doctors believe Sabrina, who started having seizures last month, may have fetal alcohol syndrome. And recently, another of Crowell's children, 3-year-old Cory, was found to have FAS and is brain-damaged for life. "The guilt is tremendous," said Crowell, who finally found help for her alcoholism this year. "I did it again and again and again. Having to explain that I did that to them is going to be the hardest thing. I don't know how I'm going to tell them. It was something I could have prevented." If Sabrina has FAS, she would be one of about 5,000 children born in the nation this year with the debilitating syndrome, the leading preventable cause of mental retardation. In Pima County, 20 to 30 children are born each year with full-blown FAS. Another 200 babies are born in the county each year with fetal alcohol effects (FAE). Ironically, FAE can cause even more emotional and social problems than FAS. Its victims are smart enough to know they have problems, and there are fewer social services for them than there are for those with FAS. The damage caused by maternal drinking is also devastating to society. More than $330 million is spent in the United States each year caring for people with FAS. And while numbers vary, some believe the annual cost of caring for all people damaged prenatally by alcohol is as high as $9 billion. For the children, the future can seem almost hopeless. "Innocent children are being devastated by alcohol," said Dr. Anna Binkiewicz, a pediatrician at University Medical Center and a nationally recognized advocate for abused and neglected children. "We're creating a group of children who will be unemployable. They become adults who cannot function. Prenatal alcohol exposure is a major cause of destroyed human potential for an enormous group of people." 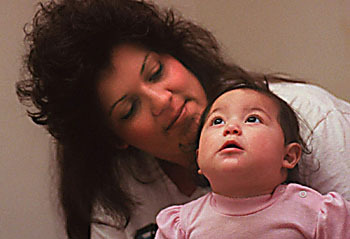 FAS was first diagnosed in the United States in 1973. We've known the devastation of maternal drinking for 25 years, yet pregnant women continue to drink. Although 85 percent of women know drinking during pregnancy is dangerous, 1 out of 5 pregnant women drinks. And some obstetricians continue to tell their patients that drinking is all right. Experts say there is no safe level. Exact figures on the rates of FAS and FAE have yet to be determined. Some believe as many as 2 in a thousand children are born with FAS. In some remote Alaskan villages, FAS has been reported in 1 out of every 5 births. Nationally, FAE is found in as many as one out of 50 children, although it is more difficult to diagnose than FAS. Children with FAE may have as many disabilities as those with FAS, but they don't have the telltale facial features indicative of FAS.